Ghassan Zaqtan, major Palestinian poet and Director General of the Literature Departmant of the Palestinian Ministry of Culture and Fady Joudah, Palestinian-American poet and winner of the Yale Younger Poets prize, will discuss Zaqtan’s first poetry collection to be published in English, translated by Joudah, on Tuesday, April 10, 2012 at 8:00 p.m. in the Standish Room, Science Library, on the University at Albany’s uptown campus. Earlier that day at 4:15 p.m., the author will present an informal seminar in the same location. Free and open to the public, the events are sponsored by the New York State Writers Institute and International Poets in Conversation, part of the Harriet Monroe Poetry Institute’s consortium tour. Ghassan Zaqtan, poet, novelist, journalist, screenwriter and playwright, is a major Palestinian poet and a leading representative of the avant-garde in Arabic literature. His most recent collection— the first to appear in English— is Like a Straw Bird It Follows Me (2012), which was translated by Fady Joudah, a Palestinian-American poet and winner of the Yale Series of Younger Poets competition for his own collection, The Earth in the Attic (2008). In the newly translated collection, published originally as Ka-tayr min al-qashsh yatba’uni in Arabic in 2008, Zaqtan departs from the lush aesthetics of such celebrated modern Arabic poets as Mahmoud Darwish and Adonis to define a new aesthetic characterized by delicate narratives, whirling catalogues, and austere descriptive language. The poems mine personal and collective Palestinian experience to address issues of memory, history, exile, and return. Zaqtan was born in Beit Jala, near Bethlehem, and spent part of his youth in refugee camps where his father, a poet, worked as a United Nations official. He resided in Jordan, Lebanon, Syria, Cyprus, Yemen, and Tunisia before returning to Palestine in 1994. He is the co-founder and director of the literary arts organization, the House of Poetry in Ramallah, and is currently the Director General of the Literature and Publishing Department of the Palestinian Ministry of Culture. 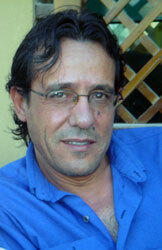 He also edits the literature supplement of the Palestinian daily newspaper al-Ayyam.